So, I've found myself in a bit of an awkward place. I'm working on four different projects at once! I was cutting fabric for one project and it was just too easy to cut fabric for a second project. Then one thing led to another... Now, I've got four projects in various states of completion. It's not so bad, really, except that my work space is seriously crowded and sometimes I don't know what to work on for the day. Indecision, I know thee well. First up is my Dutch Darlings quilt top. Dutch Darlings is a new pattern that I'm testing for Cristy Fincher. All I have so far is my fabric pull for the project. I'm not behind... yet. I will be if I don't get a move on! Seriously, I should be working on this one now instead of writing up this post. I can't decide if I'm just being a responsible blogger or procrastinating. Probably the latter. Next, I've had this pull of batiks out on my table for over a month! I have a plan for these and the background fabric is all cut out already. That's why I'm counting this as a WIP rather than just a project pull. It also counts as a WIP because it's taking up space on my work table. I'm also working on this fun quilt block. It's for a quilt pattern called Adam's Rib, designed by Toby Jacobson for Fons and Porter. I modified the pattern slightly to fit my needs. Anyway, keep an eye out for this one; I'm excited about it. Last, I'm working on a HRT (Half Rectangle Triangle) quilt top using these fabrics plus some black and white. I wish I had some pictures of the HRTs to share but at this time of year the best lighting in my work space happens right around dinner time. Which means I'm always too busy at that time to take photos. So, yeah, four projects at once. I feel like I'm all over the place. 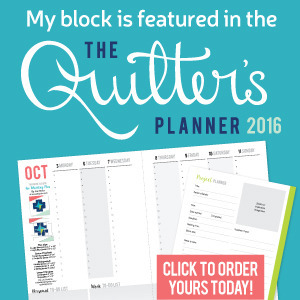 Do you work on multiple projects at once or are you a one-at-a-timer (a mono-quilter) like me? If you do work on lots of stuff at once how do you keep track of it all? This has been one of those weeks where I don't want to do anything but sit on the couch and binge watch Netflix. Chores... Pfft. We don't need clean dishes! We can eat leftovers! I know you all know what I'm talking about. Anyway, for those of you who are new, Color Play Friday (CPF) is a fun weekly challenge hosted by Trina from In an Otter Life and Lorinda from Laurel, Poppy and Pine where they provide one of their photographs as inspiration and then all the participants create a color palette and fabric bundle based on the photo. This week's photo is called Sprouts. Let me just say that I do not have a green thumb. I've managed to kill every houseplant that has crossed my threshold. 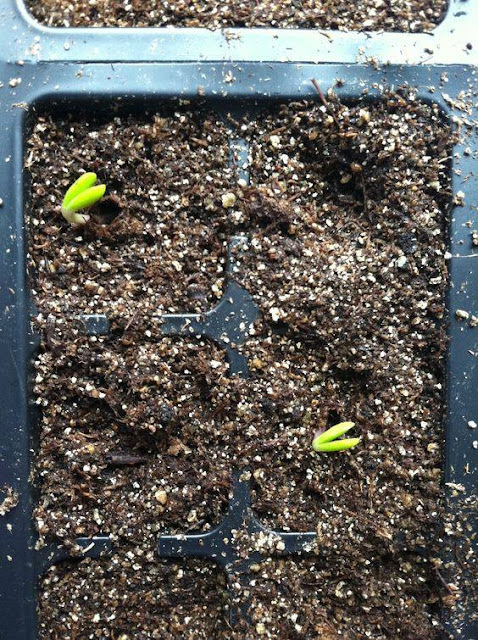 I'm mystified by those of you who can take a seed, drop it in dirt, and have something sprout up a few weeks later. I think there must be some sort of voodoo who-doo magic involved. What I can do is play with color. So here is what I came up for the week. At first glance, the photo doesn't seem to have a lot to work with because, well, it's all dirt! Lol. I was very surprised to find that the plastic planter had more blue in it than black. If you've been following my CPF's, you may have noticed that if I find blue in the photo, I tend to run with it. Run with it I did! I used that as my starting point and then pulled the green, yellow, and cream from the sprouts. Then I added in brown because I couldn't really ignore 80% of the photo. Lol. 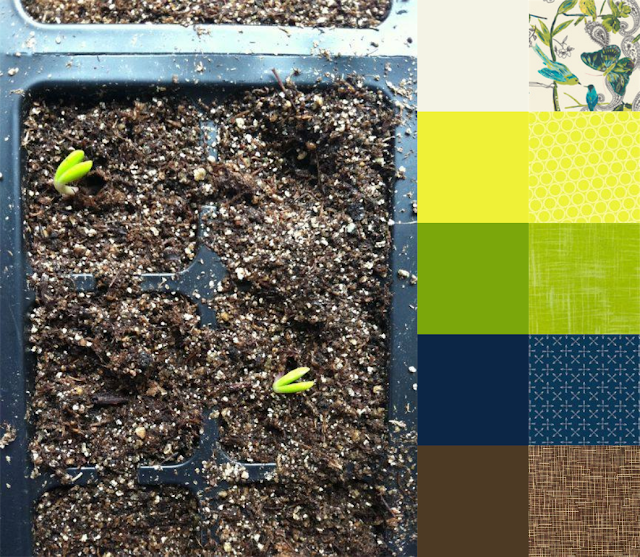 My palette felt a little iffy until I found that Bari J. print and then suddenly everything came together. It's funny how one fabric can change the whole bundle. The rest of the bundle is pretty standard for me. It's all blenders and, of course, I used a Painters Canvas print again. I can't help it. I know what I like! Be sure to check out the other CPF participants this week! 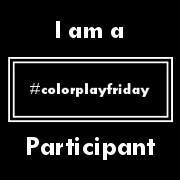 Welcome to another Color Play Friday!!! For those of you who are new, Color Play Friday (CPF) is a fun weekly challenge hosted by Trina from In an Otter Life and Lorinda from Laurel, Poppy and Pine where they provide one of their photographs as inspiration and then all the participants create a color palette and fabric bundle based on the photo. 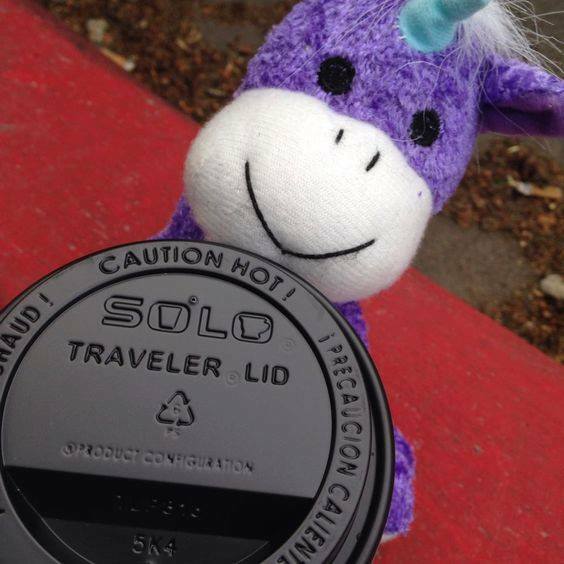 This week's photo is one of Trina's and it's called Purplishous Gets Coffee. That's one happy unicorn! Makes sense. I mean, I'd be happy if I had some coffee right now. Truthfully, I just finished my morning dose of caramel hot chocolate. So, so good! Anyway, here is what I came up with this week. I'm sure Trina has some interesting back story on Purplishous. I'd love to hear it. Anyway, I chose to completely disregard the red and focus entirely on Purplishous for my palette/bundle this week. I started with the purple as my focus color and I'm very pleased I found a focus fabric to match! From there is was an easy leap to work in the pretty blues from the unicorn horn. Then I pulled the light grey from Purplishous's hair and the darker grey from around that happy smile. Hello and welcome to the first day of the 2016 New Quilt Bloggers Blog Hop! First off, I want to give the three hosts a HUGE thank you for all their hard work in putting this hop together! So thank you Yvonne @ QuiltingJetgirl, Cheryl @ MeadowMistDesigns, and Stephanie @ LateNightQuilter! Let me introduce myself! My name is Sarah, I'm in my early 30's, and I'm a quilter. I'm deeply passionate about what I do and I try to share that here on my blog and on my Instagram account. 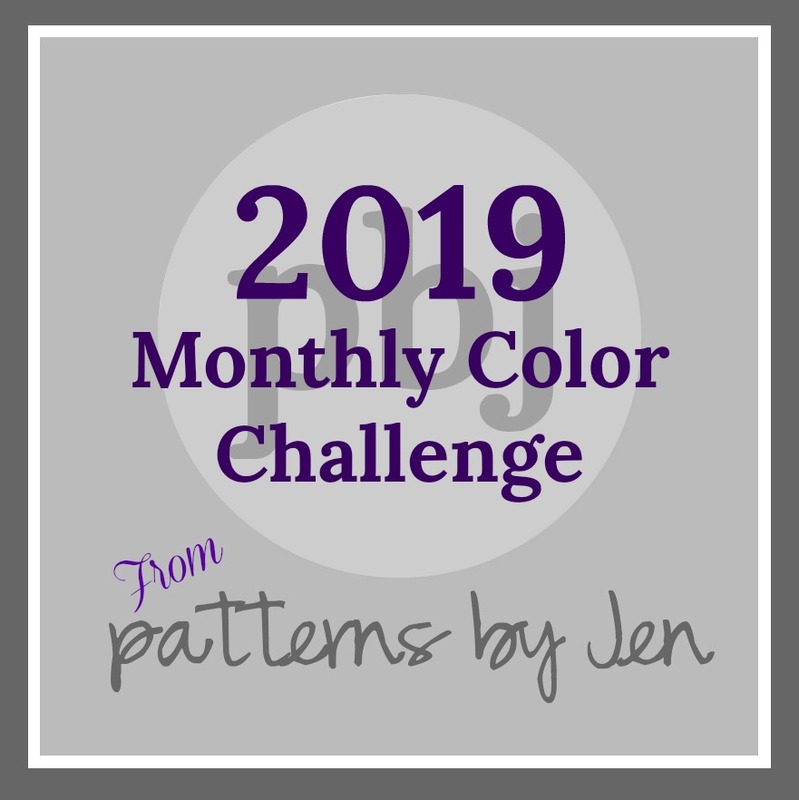 I love to play around with color and I participate in a weekly challenge called Color Play Friday. You can read more about it on my Color Play Friday Page. I also love to laugh and hopefully I can make some of you laugh with my How to Speak Like a Quilter page and my Mr.123Quilt Says... page. I hope you stay a while and take a look around. So, what exactly is an origin story? If you’re a comic book nerd, you already know. For everyone else, it’s an account or back-story explaining the circumstances of how that character came to be; or in my case, it’s my story of how I became a quilter. A long time ago, in a galaxy far, far away… Just kidding!!! Okay, here’s the real story. I’ve been crafty for as long as I can remember. As a kid, I was deeply passionate about loom weave potholders, embroidery floss friendship bracelets, painting ceramics, crochet... the list goes on. Now, I don’t actually remember seeing my mom sew anything but I know she did because I vividly recall a pair of homemade, zebra striped hammer pants that were probably pretty cool back then. Hideous I tell ya! I do, however, remember her teaching me how to thread a sewing machine. So she must have taught me how to use it, right? Who knows, but I can say that after that I hoarded bits of fabric and made clothes for all my Barbie dolls. Fast forward a few years to high school math class. I spent more time in class doodling on my graph paper than paying attention to the lessons. A lot of my doodles started to look like quilt patterns and one day I decided to actually make a quilt. It’s important to note that I didn’t grow up in a quilting household. I don’t think I had ever even seen or held a quilt in person before, so this attempt was met with a few sideways glances but I was determined. I got some supplies… and that’s that, a love affair was born. My first quilt in all her green and yellow glory! I had no idea what I was doing. Seriously, I was just winging the whole thing! Surprisingly, it’s held up really well over the years. It’s currently my “couch” quilt, so it gets a lot of use! I quilted on and off for several years until about 2012 when I needed a baby gift and thought a quilt would be a good idea. I really think that baby quilts need to come with a warning: “This is a gateway quilt into a life full of fabric and sewing addiction!” Anyway, there you have it, that’s my origin story! This is my Xbox and Botox quilt top. Blogged here and here. This gorgeous mini is one of my favorites. Blogged here and here. A baby quilt for my niece. (Those baby quilts! I'm tellin' you, they're gateway quilts!) Blogged here. In the spirit of the 2016 New Quilt Bloggers Blog Hop, I thought I'd share a few tips with you! Scraps. We all have them! Some more than others! It's a good idea to trim your scraps into commonly used sizes. 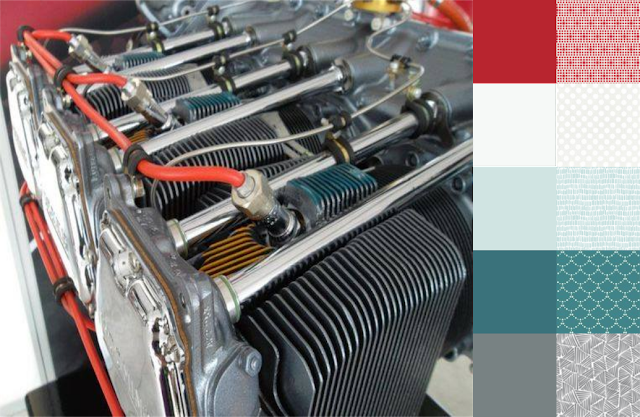 2 1/2" squares, 5" squares, 2 1/2" strips are good examples of common sizes. This way you can easily work them into your projects. Do you have a scrap mountain rather than a small heap? I suggest trimming down just five scraps per sewing session; that way you won't get overwhelmed by all the trimming! Also, (I guess this is a bonus tip) you can use those scraps as a leader/ender project and pretty soon you'll have the makings of a new quilt top! Favorite Movie: Bill and Ted’s Excellent Adventure (because I like History, lol). Favorite TV Show: What is Jeopardy?! Favorite Book: … IDK, I read them all! I really love historical fiction. Favorite Place to go on Vacation: The beach!!! I sat down and made a list of all the quilts I want to make. That maybe wasn't such a good idea... Now I know that I have over 150 quilts on my bucket list. That's way too many!!! I have to do some paring down. Do you have any quilty confessions? I would love to hear them. Thanks so much for stopping by my blog today! Please hop over to some of the other blogs in the 2016 New Quilt Bloggers Blog Hop. I’m in the Hive Sewciety Hive and here are the links to some of my fellow hive mates who have posted today! Hello all! 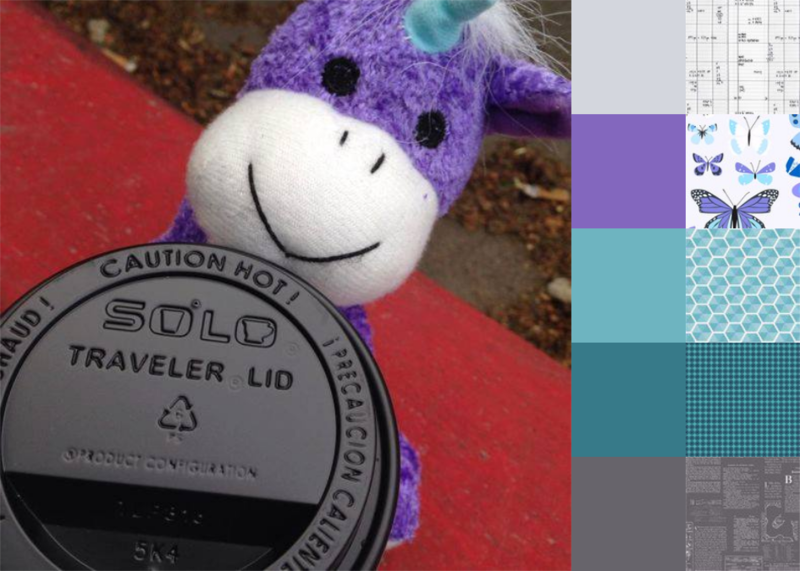 Welcome to another edition of Color Play Friday! This week's photo is called Brick Wall. 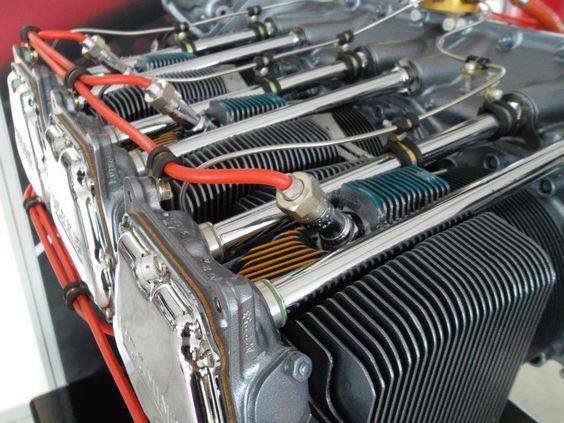 I'm always amazed by the variety of photos that come up for the CPF challenges. Here is my interpretation of this week's photo. At first glance, I thought this photo would be all greens and ... 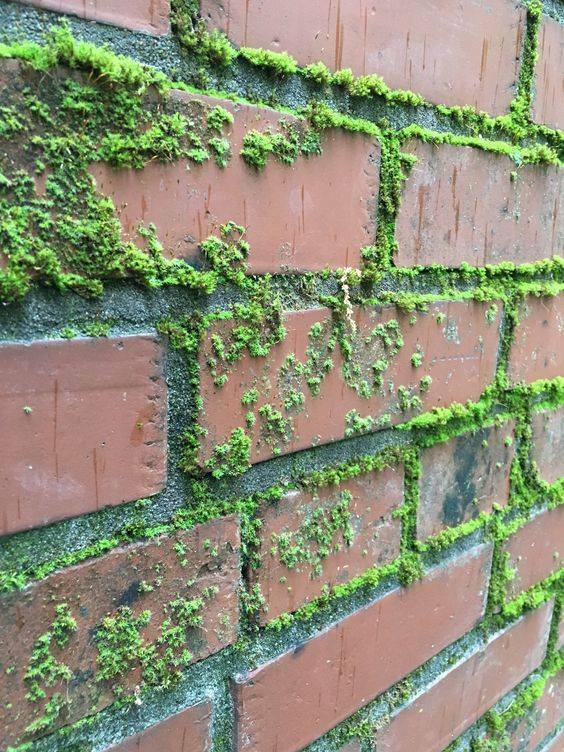 I don't even know what to call the color of the bricks. It's not quite Brick, not orange enough to be Terracotta. Mauve maybe? Anyway, it turns out there was quite a bit of blue in the mortar. So I ran with it! Lol! 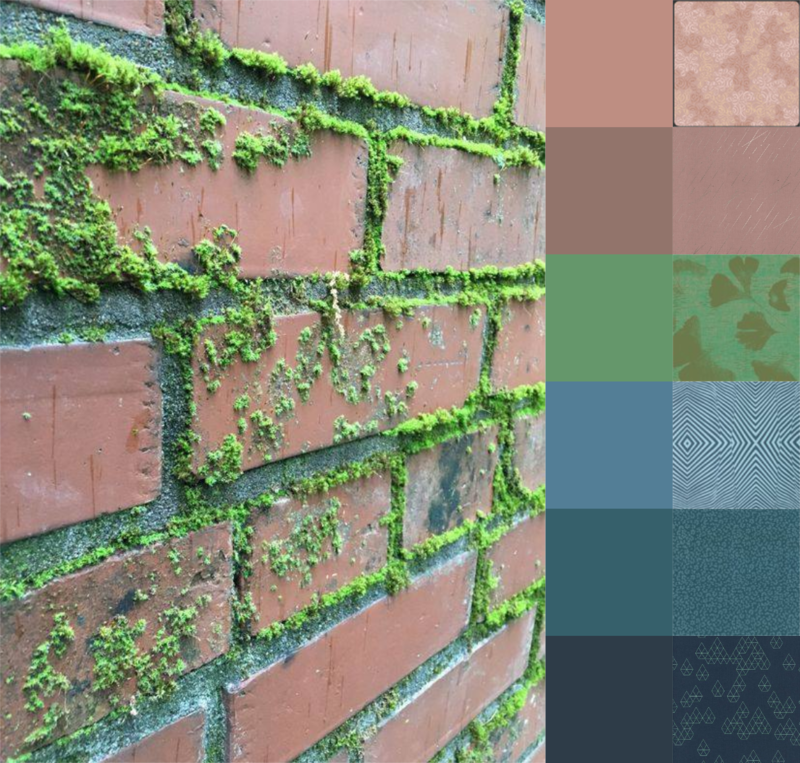 It took me a bit longer to curate this fabric bundle. I had a hard time finding those mauves... or are they Mushroom? Overall, my palette/bundle has a duskiness to it that I rather like. NOTE: Some of these fabrics had different color values on different websites. Be aware that colors do not always show "true" on the computer screen. I "shopped" at Stash Fabrics and Hawthorne Threads this week. Be sure to check out the other participants this week. 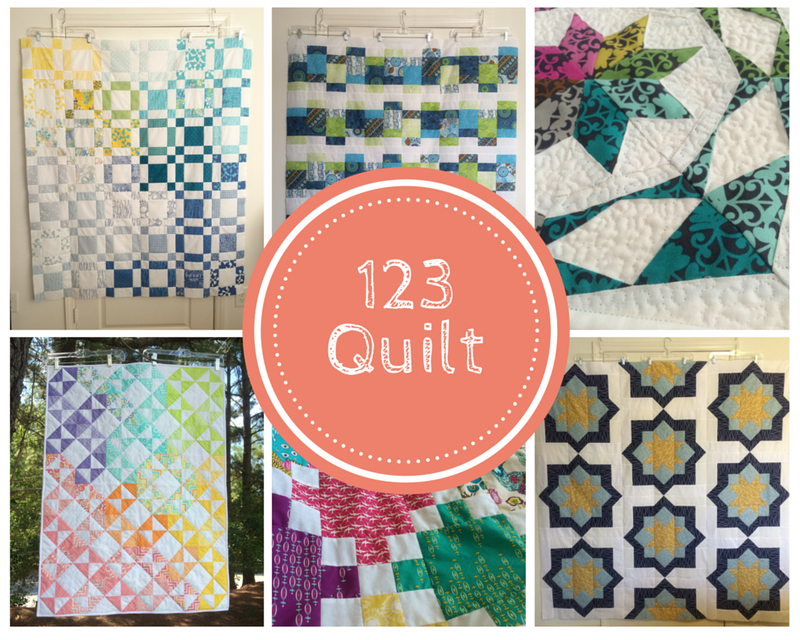 Opposites Attract Blog Hop Day 4 - Icebergs Mini Quilt and Giveaway!! 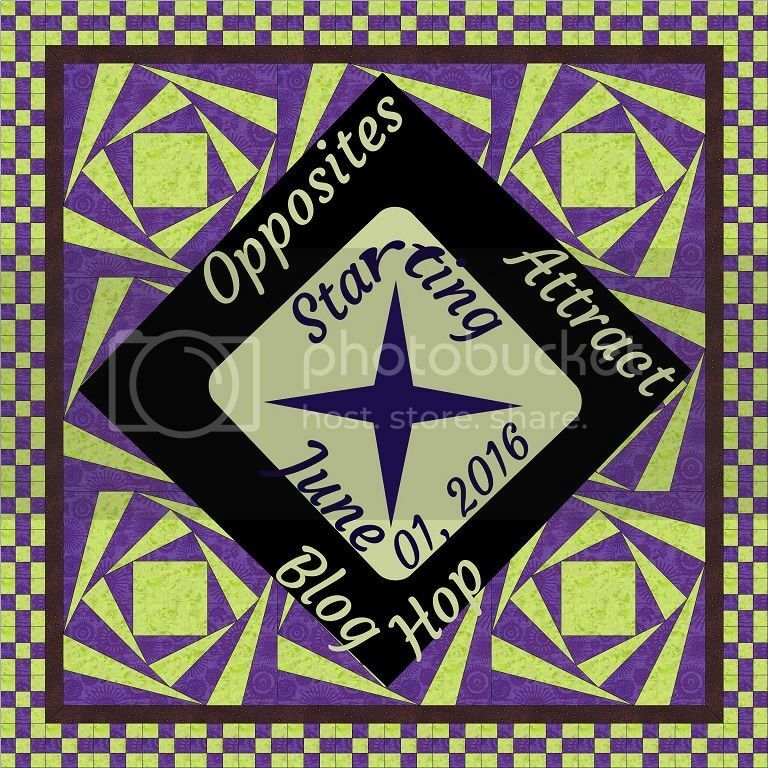 Welcome to Day 4 of the Opposites Attract Blog Hop hosted by Marian of Seams to be Sew! This is my first time participating in one of Marian's hops and it has been so much fun! Marian hosts several hops throughout the year featuring project ideas and the odd tutorial or two. And, of course, there are giveaways! I want to give a huge thank you to Marian for organizing everything and to the Fat Quarter Shop and DJ Inkers for sponsoring the hop. There is more info about today's giveaway later in my post, so keep reading! The theme of this blog hop is two- and three-color projects. I knew immediately that I wanted to use just two colors and that I wanted to come up with my own design. Measuring at just 24" x 24" finished, this mini quilt is quick and easy project that can be made as a wall-hanging or even as an over-sized throw pillow. I used Kona White and Kona Glacier as my two colors. I have to admit that Mr.123Quilt picked the color. I gave him a few options, mostly in shades of blue, and this is the one he picked. After seeing my design, and knowing that the color was called "Glacier", he thought it would be a good idea to name my design "Icebergs." Glacier... icebergs... Yeah, it works. I love that he "helps" in the design studio. For the piecing and quilting I used my favorite Essential Thread in White from Connecting Threads. I decided to do some very minimal quilting to highlight the icebergs. I quilted one narrow echo line on the tops of the icebergs and two narrow echoes on the bottoms. I really like how this quilting mimics the heaviness of the bottom of the icebergs and the lightness of the tops. In fairness, I have to admit that I have never had so much trouble with binding before. It was just one thing after another! First I prepared the binding using the Kona Glacier, but then I decided I wanted to use the Kona White instead. Then, I measured the binding wrong! It was less than 1/2" short. Can you believe it? So I had to do a quick patch job. I thought I was ready to rocket on and get this guy finished but then I ran out of bobbin thread. Sigh. So I had to stop, wind a new bobbin, re-thread the machine. What else could go wrong? This. This went wrong. I sewed right through a pin! And it was one of my favorite pins too! Thankfully I didn't cause any serious damage to my machine, just a blunt needle. Needless to say, I was SO relieved when I finally finished the binding and could call this mini DONE! Lol. Sometimes the trials and tribulations are the funniest parts of the whole process. If you would like to make your own Icebergs mini I will have a tutorial coming out soon! Here is the list of today's participants ans well as the schedule for the entire hop. The first giveaway is for a $25 gift certificate to the Fat Quarter Shop. I know what I'd spend it on. Do you? Head over to Marian's blog to enter the second giveaway sponsored by DJ Inkers! Be sure to visit and comment on all of today's blog hop posts for your best chance to win! Good luck! I really do love Color Play Friday. 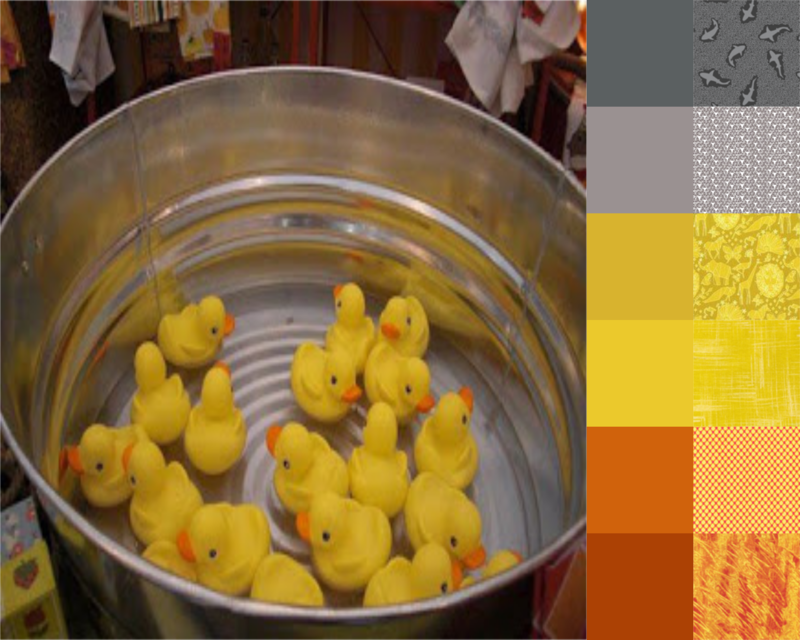 It's a great way to exercise some color theory and it gives me the chance to vicariously shop for fabric, lol! 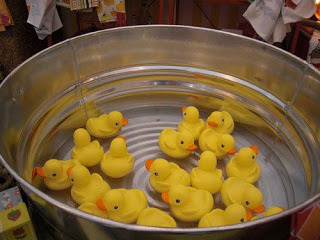 This week's photo was taken by Trina and is called Rubber Ducks. I'm really pleased with my palette/bundle this week. Oranges and yellows are difficult for me to work with but I think CPF is helping me work out those creative muscles, so to speak. My fabrics are somewhat themed this week. The first is called "Feeding Frenzy" and the second is called "Fishing Net." A bit macabre, a bit tongue in cheek. Also, did you notice I used Painters Canvas in my bundle again? I can't seem to get away from it! Do you have a particular go-to fabric that just seems to work with everything? Grunge? Crosshatch? Anything?